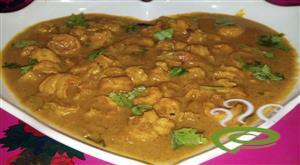 For preparing nadan tharavu curry, grind together coriander powder, chilly powder, turmeric powder, pepper powder, cinnamon, cloves, cardamom and little oil. Keep this aside. Heat oil in a pan, fry onion, ginger, garlic and green chillies. Add the previously ground masala to it. Add the duck, vinegar, salt and 3 cups of coconut milk into it and cover the vessel with a hollow lid (fill some water in the hollow lid). 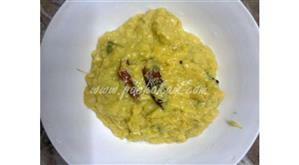 When potato gets cooked, add 1 cup of coconut milk and cook for some time and remove from flame. Splutter mustard seeds, red onion and curry leaves in coconut oil and ghee. Pour it on the curry. 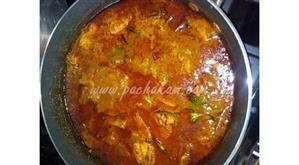 Nadan tharavu curry recipe is ready. 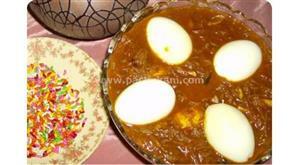 Serve it with palappam.